As if the last few days were not strenuous enough, Gideon and Abu had Anna and me up and packing at 6:00. We had a 19 km hike down off the mountain, and Gideon started at what felt to be a 5 km pace. It was downhill but not always an even track. We kept it up with only one five-minute break all the way to the bottom, finishing in just over 4 hours. We left Anna and Abu far behind and, after some paperwork were all were on the bus heading back to Moshi. It was a clear day, so I was able to see much more than on the misty drive up. Kilimanjaro loomed behind us, looking steep and stark, making me wonder how we ever got to the top of it. The road to Moshi is lined with villages which, along with tourism, are agricultural. I saw the occasional tractor, but most of the work in large fields of corn and rice was done by hand– people of all ages swinging heavy hoes. At the edges of the fields were cows, tethered by a ring in their noses. We passed many people carrying stuff (usually bananas) on their heads, and the ubiquitous scooters transporting things of all shapes and sizes, including a wide box piled high with chickens. In the villages the merchants and craftsmen displayed their wares by the road, including wooden furniture and, in one, what appeared to be finely crafted children’s caskets, both disturbing and beautiful. 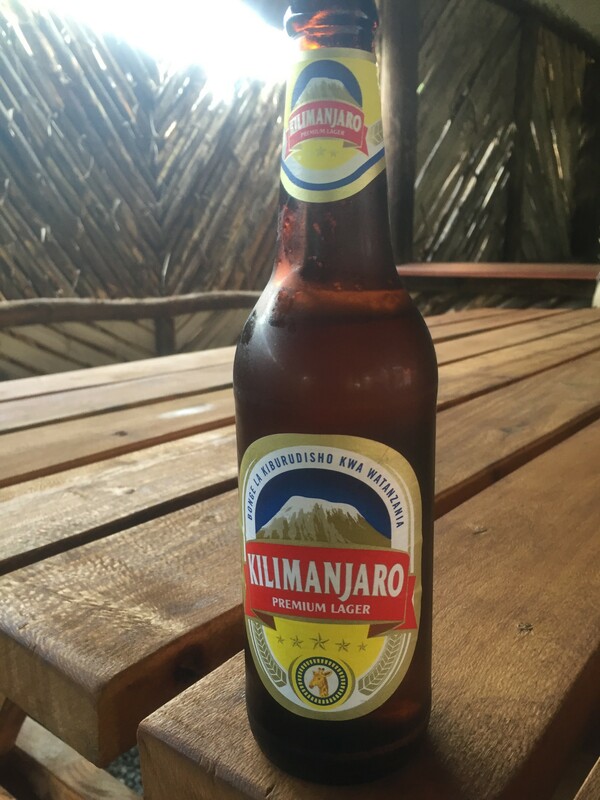 On arriving at Moshi, we drive to the Hidden Valley office where Primo made one last meal– grilled chicken– and they had cold beer. Gideon and I shared a drink (though he drinks his beer warm) and we all had champagne, toasting the expedition’s success. Then Richard led the crew in several songs to celebrate. It was embarrassing and wonderful–wish I could have recorded the music. Hugs and high-fives all around, we departed. I made arrangements for a day-long Safari to Lake Manyana park tomorrow and was deposited at my hotel where I had exquisite sleep (but an early morning).